As mentioned when you were over last I’d drop you an email on ‘The meaning of Life’. I believe life has a purpose and the ultimate aim is to know your creator (before you meet him). I’ve never actually written an email quite like this before so I hope it comes across correctly. I guess the very ‘British’ thing is maintain a status-quo by not openly discussing beliefs. However, I also believe in the very foundation of truth which underpins this world, our lives and – in the end, the outcomes. If it helps I don’t believe anyone is absolutely sure. I’d say I’m about 95% sure and I’m happy to discuss my reasons why (I guess science, history and philosophy seem to back my view up, but the ‘epistemology’ of these faculties mean they are (by definition) quite different). When we were at the pub, I think I remember using a pint glass to draw a Venn diagram to say you can intellectually know God (one circle) and you can also experience his love and direction in your life (the other circle in the Venn diagram). The best place is both (i.e. the middle of the Venn diagram) where you have the love and passion for life whilst knowing God and understanding the world from an intellectual perspective. It’s a bit like putting on some glasses and simply seeing things differently. I should add at this stage that I’m not particularly ‘religious’. In fact, Jesus was vehemently against religious people as they make rules that can’t be kept, tie people to rules and regulations, potentially providing a framework for corruption and ultimately blinding people. How to know God (the easy way). 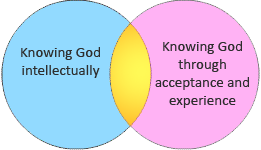 The ‘experiential’ part of my Venn diagram (the pink circle) is simply those people I know who walk with God. They listen for his voice and guidance and are full of passion and praise. At the very heart of this is a relationship based on finding out what they can do for God (and not the other way around). Jesus said ‘Seek and you will find’. God meets us more than half way on this – but if people aren’t seeking then they won’t find and people are capable of believing what they want to believe. The starting point is realising we’ve fallen short of God’s perfect standard and we ask him for forgiveness to make himself real in our lives. The process builds as we read his word (for example the life of Jesus told in Mathew, Mark, Luke or John) or books explaining his life (for example James, Timothy or Acts). I’d recommend anyone to join an Alpha course if they are considering the above as this is a structured and fun way to explore the Christian faith. An Alpha course is for people who've got questions - whilst I've know people to walk into a church and never walk into a church again as they were 'put off' for various reasons. Although this is the ‘simplest’ way to find God, it lacks the understanding to deal with some of life’s hardest times and toughest questions. Life is often hard and nobody is spared this. I’ve actually found my life harder because I believe in Jesus – and not easier. Bad things happen to good people and good things happen to bad people. Without a deep understanding of God (as shown below) people can quickly become disillusioned and walk away from God, despite having known him. I believe once a person has been saved – they are always saved. We’ve not earned our salvation (knowing God in part whilst here on earth and knowing him in full in heaven) but it’s a free gift from God and nothing can take it away. But at the heart of the Christian message is reconnecting with God and not about going to heaven. For other people, questions such as ‘why is there something rather than nothing?’ (i.e. Why does anything exist at all?) may start to take them on a journey of understanding, science, philosophy and faith. There are other beliefs and faiths and the claim of Christ that he is the only way seems rather arrogant (links below). But the truth is important to everyone and the claims are unique to Jesus. We all carry our own world view or (this)– i.e. the way we interpret the world and make sense of it. For others there are hard questions, such as ‘Why does God allow suffering?’, ‘How can a loving God make people go to hell?’, ‘Does science mean God is out of a job? (or ‘God of the Gaps’ theory)’. I don’t wish this email to be a definitive guide – but rather a starting block for finding interest in other subjects. I’ve put a few links below. I also believe that ‘only dead fish go with the flow’ which means a point of view may not be held by consensus of the majority, but if someone is able to rationalise their view against a majority, it could simply be that they have put more thought, time and effort into it. I guess the reason I’m being more outward in my faith is that, having turned 40, I can safely say that life is finite and it’s almost a matter of life or death to try to make sense of the word as much as possible - but faith isn’t blind, in fact it’s the opposite, the search for truth. I believe having discovered the truth it actually makes life more exciting and rational. Any rate – enough said and I’m sure you’ve got a tonne of things to do. Look forward to seeing you soon. Find an Alpha Course near you. In reality there are many more courses than listed on the site. Understanding that everyone does have a set of glasses to see the world and a filter to accept facts which point to truth. Rather long but if I recommend a short video then there are too many gaps. Did Jesus claim to be God, the Son of God, neither or both? Too many links but they are conclusive on the fact that Jesus unambiguously claimed to be God. Actually, Richard Dawkins has probably done a favor really. Unfortunately by pointing out religious nonscence he's also 'thrown the baby out with the bath water'. Maybe only I find this clip funny – otherwise there's always Mitchell and Webb.